My family is a Ranching family. I grew up in La Sal, Utah, which is just south of Moab, Utah, and my dad was a rancher. He worked hard every day, either out managing the cattle, checking the irrigation, fixing fences or running the tractors as he was cutting, baling and hauling the hay that would get the cows through the winter. I am the oldest of six children, but I am a girl. My younger brothers were the ones who got to (they will tell you they HAD to) work with Dad every day, while I played and did "Girly" things with mom. I did get to (though at the time it was a HAD to) go and feed the cows on Saturdays, and I did finally learn how to run a tractor, though I never had to bale or haul the hay like my brothers did. My dad worked really hard to provide for our family, and even though my brothers were able to work with him a lot, my sisters and I didn't really have that opportunity. Enter the Daddy-Daughter Date. Our church would organize the occasional Daddy-Daughter date night, with the idea that we would get some one-on-one time with our dads, away from the distractions of siblings and work. These Daddy-Daughter dates were a lot of fun, and I loved the opportunity to dance with my daddy and have his undivided attention. About 10 years ago, a group of Dads and their 3rd Grade daughters came for a Daddy-Daughter date weekend on the river. 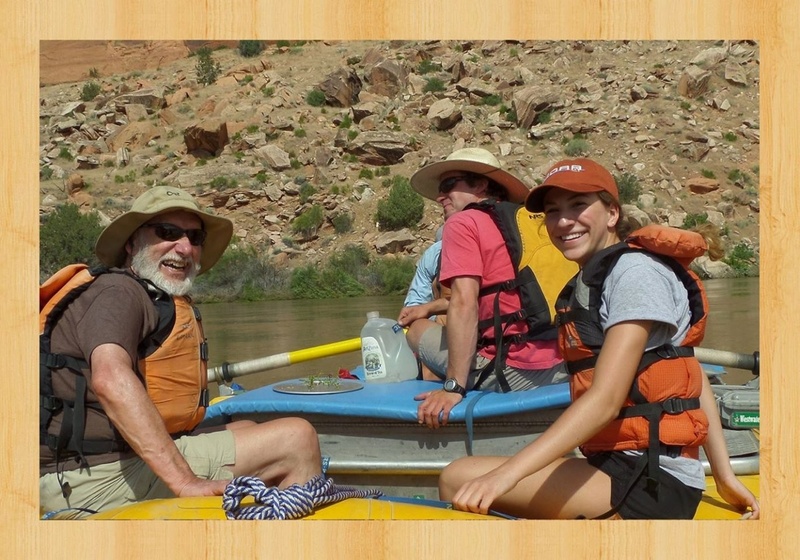 They came to Moab to spend 3 Days and 2 Nights on the Colorado River. The trip was purposely run at a slower pace, with lots of time for the girls to play on the sand and in the inflatable kayaks with their dads. Our guides took care of all of the cooking, while the Dads and Daughters worked together to set up their tents and sleeping gear. The Dads and Daughters had lots of time to play together without the distractions of TV, sports, phones, other family members or work needs. Since that first trip, the group of Dads and Daughters has returned again and again over the years. The group has changed somewhat over the years. Many of the Dads have been the same, but the Daughters aren't always the same as their younger sisters have taken their turns on the river trip when they have graduated the third grade. The group joined us again this year for another great rafting trip. The girls were all so cute! We really enjoyed having them all on the river with us again, and we look forward to seeing them again over the next few years. We had another Daddy-Daughter duo join us for one of our Multi-Sport Adventures in June, but this duo was a Grand-Daddy and Grand-Daughter. They participated in a Zipline Tour, a Sunset Hummer Tour, a Horse-back ride and a 1 Day Westwater Canyon Rafting trip. They had a great time together here in Moab and we look forward to seeing them again in the future. It's never too late to set up your own Daddy-Daughter date, whether it is just going out for dinner or taking a longer adventure vacation together. The time spent together is priceless, and cannot be replaced.